List the most successful players ever in the women’s event of the Europe Top 16 Cup and its predecessor the Europe Top 12 Cup and two players who will be on duty at the forthcoming event to be staged in Montreux, Switzerland on Saturday 3rd and Sunday 4th February fit the bill. 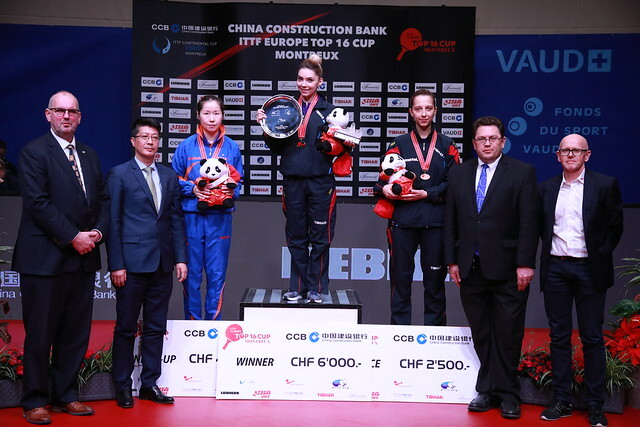 Austria’s Liu Jia and Luxembourg’s Ni Xialian will both be on duty at the China Construction Bank 2018 ITTF Europe Top 16 Cup. Liu Jia will be making no less than her 15th appearance in the competition, for Ni Xialian it will be the 13th occasion she has plied her skills with the elite of the old continent. However, it is not just a question of longevity that makes the names stand out. The first venture for Liu Jia was in 2001 in Wels, for Ni Xialian, even earlier, her initial excursion was in 1996 in Charleroi where she emerged successful and then followed suit by winning in both 1997 in Eindhoven and in 1998 in Halmstad to make it three in a row. Three in a row, it meant she matched the record of Hungary’s Beatrix Kishazi who secured the title on the very first three editions of the event; she won in 1971 in Zadar, the following year in Zagreb, before again being crowned champion in 1973 in Böblingen. No other female player has ever won on three consecutive occasions but it is the record of Beatrix Kishasi that both Liu Jia and Ni Xialian strive to emulate. Similar to Ni Xialian, Liu Jia has won three times, her claim to fame being that she has the longest time gap in securing the top prize. She won in 2005 in Rennes prior to regaining the title in 2014 in Lausanne and then repeating the feat one year later in Baku. Success in Montreux for either Liu Jia or Ni Xialian would mean a fourth title, a feat that would match the record of Beatrix Kishazi and Li Jiao of the Netherlands. Additionally, Beatrix Kishazi won 1977 in Sarajevo; Li Jiao succeeded in 2007 in Arezzo, then immediately ensuing year in Frankfurt. Later, she retained the title in 2010 in Düsseldorf and then enjoyed the same success the following year in Liège. Equally, taking into account medal winners; then a gong of any colour would take Liu Jia and Ni Xialian nearer the greatest collector of all. Bettine Vriesekoop of the Netherlands with ten (two gold, five silver and three bronze) holds the highest number of medals; for Liu Jia and Ni Xialian it is currently eight each. In addition to the three wins, Liu Jia was the runner up 2006 in Copenhagen; a semi-finalist in Arezzo in 2007, in 2009 in Düsseldorf as well as in 2016 in Gondomar and last year in Antibes. Similarly, Ni Xialian finished in runners up spot in 2001 in Wels; she was a semi-finalist in 1999 in Split and the following year in Alassio. Later she reached the penultimate round in 2002 in Rotterdam and in 2012 in Düsseldorf. In Montreux, Liu Jia is the no.3 seed, Ni Xialian the no.11 seed.